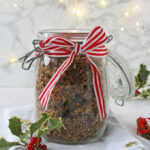 A quick and easy recipe for homemade granola with a delicious festive gingerbread flavour! Preheat the oven to 160c and line two baking trays with parchment paper. In a large bowl add the nuts. If you are making this for young children you might want to break or chop the nuts up into smaller pieces. Add the oats, seeds and coconut and mix with a spoon. Next add the cinnamon, ginger and nutmeg and mix again. Place the coconut oil in a small jug or cup and melt in the microwave. Add in the honey and stir. Pour this mixture over the granola and mix quickly until it all has been coated. Divide the mixture between the two trays and bake in the oven for 30 minutes, stirring once or twice. Remove and leave to cool and crisp up before transferring to an airtight jar or container. If adding dried fruit you can mix this in now. The granola will keep in an airtight jar or container for up to 2 weeks.